The Jay Grioux painting “Chopped & Screwed Vol. 3.” is a tour de force of layers created mostly by taping, painting and spraying. Stare at it long enough and you’ll notice leaping and bending figures, typographical elements, symbols, snakes and even angry birds emerge from the complex black-and-white composition. That’s the beauty of figurative abstraction – it changes every time you look at it, and everyone sees something different. Jay Giroux is a scavenger of incidental gestures and lowbrow symbolism from the urban streetscape. Cognizance of post-war American art informs his newest paintings. Use of a reduced, economical palette brings to mind the work of Franz Kline or Ad Reinhardt, but specifically the black and white abstractions of Willem de Kooning. 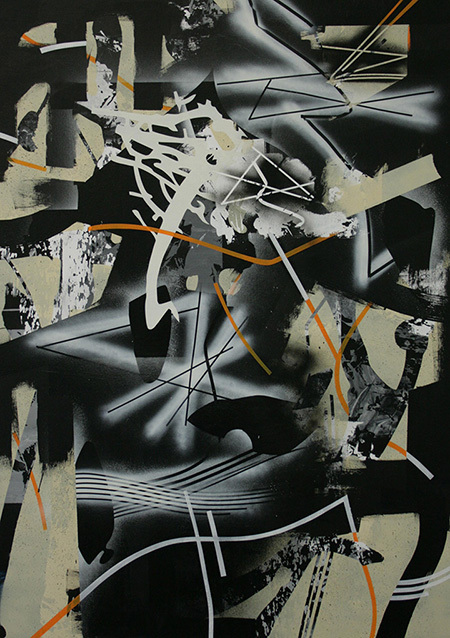 Screen printed elements interact with loose gestural marks to create tension and variety of detail, unique to each but effortlessly connecting the individual canvases.